In the cosy atmosphere of Chả Ká Restaurant, we sat listening to the sizzle of fish being fried as we waited for our food to arrive. Chả Ká Restaurant is located in downtown Hà Nội. The interior is decorated with fishing nets, bamboo fish traps and lights twinkling inside, along with black-and-white photos of farmers in the northern countryside. The restaurant is immaculate, providing diners with a cosy, elegant and clean space. It’s not luxurious or showy; more modest. The menu offers a wide range of fish dishes. The catfish served up is tasty and succulent, and garnished with subtle style. We started the meal with catfish grilled with chili and salt; catfish grilled with galangal and fermented rice and grilled fish with piper lolot. Each dish offered different tastes and scents thanks to the spices and ingredients accompanying the fish. The catfish fillets are marinated in these spices before being grilled over charcoal. 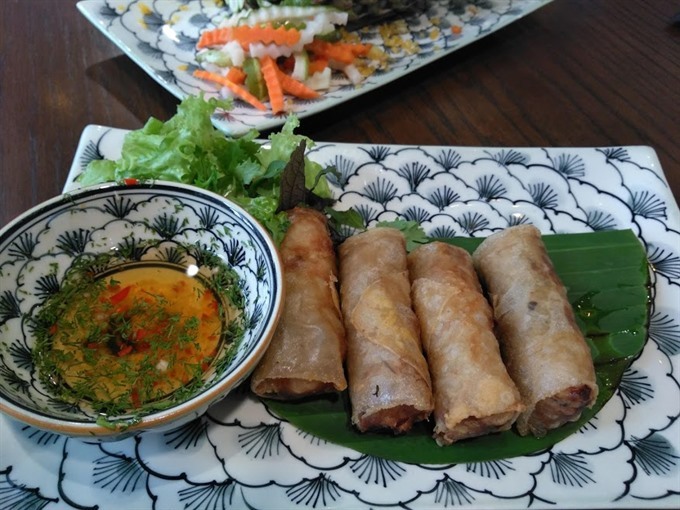 Another option for the starter also included spring rolls with fish (normally it’s made with pork as the main ingredient) and fish salad. For hot dishes, I recommend porridge with century egg and cá om chuối đậu (fish stewed with tofu and green banana). These dishes are served in big bowls for two or four people. The waitress presented the bowl in front of us then divided it into small portions. 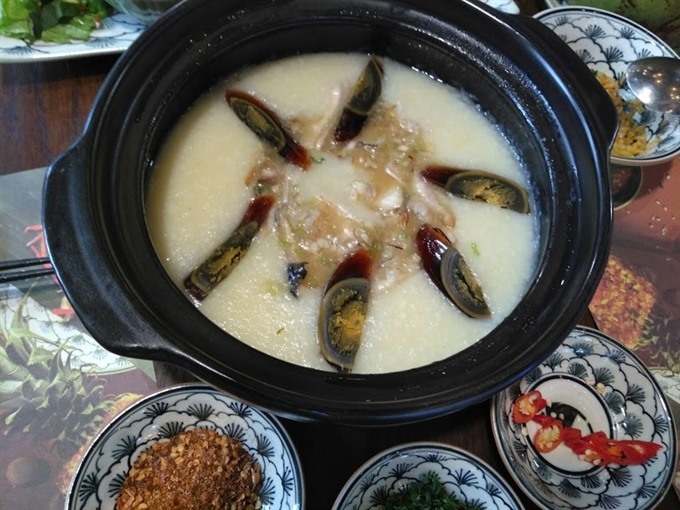 On top of the porridge, the century egg was divided into six pieces like a crescent moon. The dish has a special smell that some may not like, but we enjoyed the flavour of the jelly-like egg, which had a brown, green and navy yolk. Its taste was surprisingly creamy, velvety and succulent. 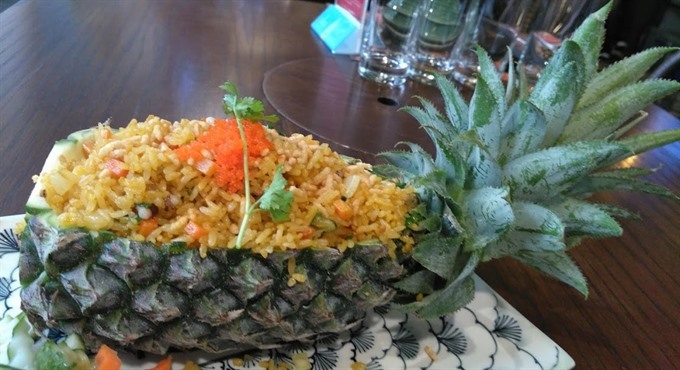 Fried rice with pineapple, topped with crab eggs. Catfish porridge with century egg. Chả cá made from catfish, the signature dish of the restaurant. After a journey to discover the fish dishes, we couldn’t forget to order a hot pan of chả cá, the jewel of the party. The fresh fish fillets are seasoned with turmeric, tempered with dill, and spiced with shrimp paste and garlic. Then they are grilled in a hot pan with fresh herbs and spring onions, and topped with crunchy peanuts. The grilled fish has a crispy skin but is still soft on the inside. 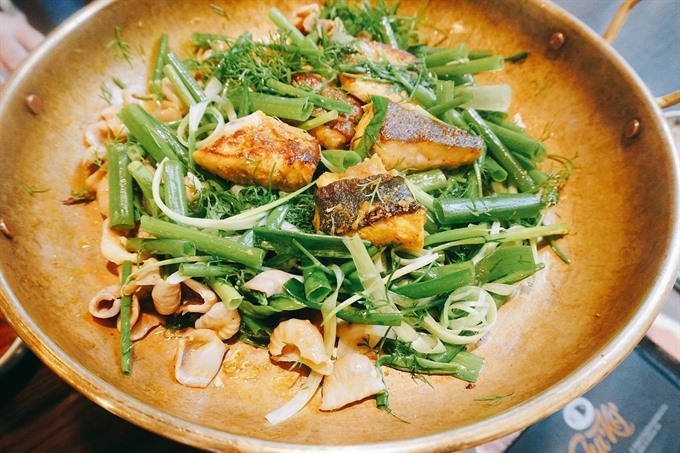 Fish guts are also on the menu for more adventurous gourmands, cooked with pickled vegetables. The sour and salty taste makes the food leave your plate pretty quickly. A diner, Hoàng Khánh Linh, was enjoying a meal at the restaurant with her friends. “When the waitress gave us a pan of chả cá (VNĐ125,000), there were only five pieces of grilled fish,” said Linh. “At first we thought it was a bit expensive because we expected more, but after the first bite, we decided it was worth the money. Guests often order fish hotpot to finish the meal. 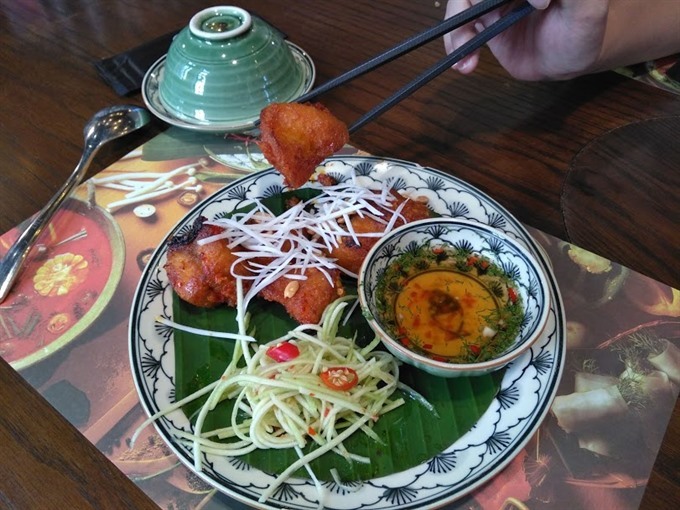 If you are a fan of Thai cuisine, you will love it. The fish is cooked with sour bamboo sprouts and tom yum.